Unlucky in love? Ever wanted to learn the tips and tricks to the art of seduction? Have you grown tired of leaving the club alone, surrounded by hordes of people who all seem to be getting lucky, with you left watching on from the sidelines? Ever wished you had a foolproof method of acquiring—and keeping—company at a bar or nightclub? Well, despair no longer! There are a group of women who might just have the solution to your qualms! 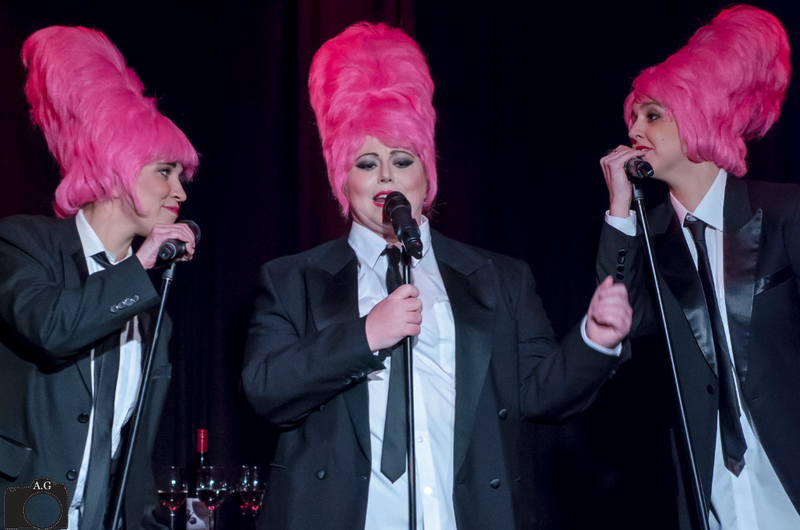 ‘A Lady’s Guide To The Art Of Being A Wingman’, performed by cabaret trio The Desperettes, is a show that defies gender stereotypes in its gloriously satirical depiction of tried (and tired) methods of seduction, exploring them in humorous and refreshing ways. Premiering on 19 July at Melbourne’s cosy restaurant / entertainment venue, The Toff in Town, this show, playing for one night only, was not one to be missed! Natasha York, Belinda Hanne Reid, and Lisa Woodbrook—the brains (and hair) behind the show—conceptualised, wrote and choreographed the performance in its entirety. 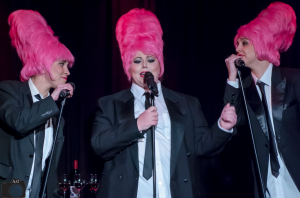 Their alter egos — DeeDee, Daisy and Delilah, respectively — take the audience on a wild and tumultuous journey through the art of picking-up and taking-home; an art (and chore) revealed to be much more complicated than initial appearances might suggest. Suited-up and balancing towering magenta beehives, the women banded together, intent on winning over the objects of their affections—and in the process, won the hearts of a captivated and much-amused audience. The show was from start to finish a truly musical experience, packed with catchy pop hits. It featured songs by Beyonce, Mark Ronson and Shania Twain, and infused these classics with perfect harmonies, rich vocals and clever lyrical improvisation. Members of the trio took turns attempting to seduce eligible candidates of their choice, dragging up onto stage any men that happened to be sitting unsuspectingly in the audience. Engaging them in witty banter, and teasing out personal and professional information by way of horrendous pick-up lines and hilarious dance moves, the show’s element of audience interaction was refreshing and engaging. To aid them in their quest was an omnipresent audio-guide, who periodically interrupted their singing and dancing to provide hilarious (and oftentimes unsolicited) commentary. Whilst principally a light-hearted and humorous affair, the show touched on some important social issues, including subtle commentary on the state of dating in the technological age, as well as addressing the often-felt pressure to act and be perceived in a certain way. Ultimately, the show highlighted the importance of self-love and solidarity, and concluded with the trio denouncing their ‘wingman-ing quest’ and resolving instead to enjoy their night out together in a celebration of sisterhood. If you missed this great performance, make sure to check out The Desperettes as they take this show on the road once again for the upcoming Melbourne Fringe Festival, which runs in its entirety from 16 Sept – 4 Oct.
After reading your review I will definitely go and see The Desperettes at the Melbourne Fringe Festival. This entry was posted in Arts, Comedy, Theatre and tagged cabaret, melbourne, performance, Review, theatre. Bookmark the permalink.